At some point, your concrete pool will likely require replastering. WestView Pools offers professional replastering services to repair any damage and bring your pool back to looking brand new. Plaster is the final layer of material added on top of gunite or shotcrete during the pool build to waterproof the pool. Usually lasting 15 to 20 years, plaster is very resilient, however it is a natural product that will to decay over time – especially after chemical and weather damage. High mineral levels in the water as well as imbalanced water chemistry can cause more rapid decay. Pitting/Etching of the Plaster – Water chemistry issues over time as well as acid washing can cause what’s referred to as “pitting” and “etching” of the plaster, which makes it uneven and rough to the touch. This can pull bathing suits, create places where dirt and debris can settle, and algae can grow. New plaster feels smooth and looks soft, giving your pool a facelift that makes it look brand new. Mineral Stains – The existence of minerals in the water, like copper or iron, can lead to stains developing over time. Metals can enter your pool in a couple different ways. The corrosion of copper or iron pipes, or copper heat exchangers in heaters (usually caused by imbalanced water chemistry) can deposit metals into the water. Additionally, the water used to fill the pool can already have minerals in it – well water specifically can have elevated mineral levels. 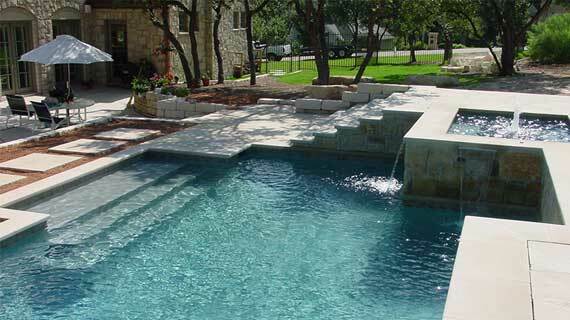 Acid washing can help remove some staining, but the pool will ultimately need to be replastered. Cracks/Holes in the Plaster – Cracking or holes can develop in the plaster over time as well, which can cause major problems. Plaster is supposed to keep the pool waterproof, and any leaks into the pool structure can cause rapid deterioration and decay that you may not be able to necessarily see. This can lead to massive structural problems that may require much more expensive repairs than simply replastering. Visual Reasons – The chemicals you add to your pool will wear away plaster over time, causing the color to fade and look dull. Many pool owners will replaster just to update the look of the pool. A newly replastered pool can have an amazing effect, and make the pool look brand new.